The LiDAR data included a classification that identified ground points, information on the number of returns for each point, and intensity values, among others. For all the LiDAR data the point density ranged from 0.6 to 3.3 points per square meter, depending on the county and collection parameters. Imagery was acquired during peak leaf-on conditions in the summer of 2010 through the National Agricultural Imagery Program (NAIP) at a resolution of 1 m. The imagery consisted of 4-band (blue, green, red, near-infrared) data. Building polygon data were available for 12 of the 67 counties in the state. Building polygons were used to distinguish the tree canopy from the buildings in LiDAR data. There is one data file provided in GeoTIFF (.tif) format. Figure 1. 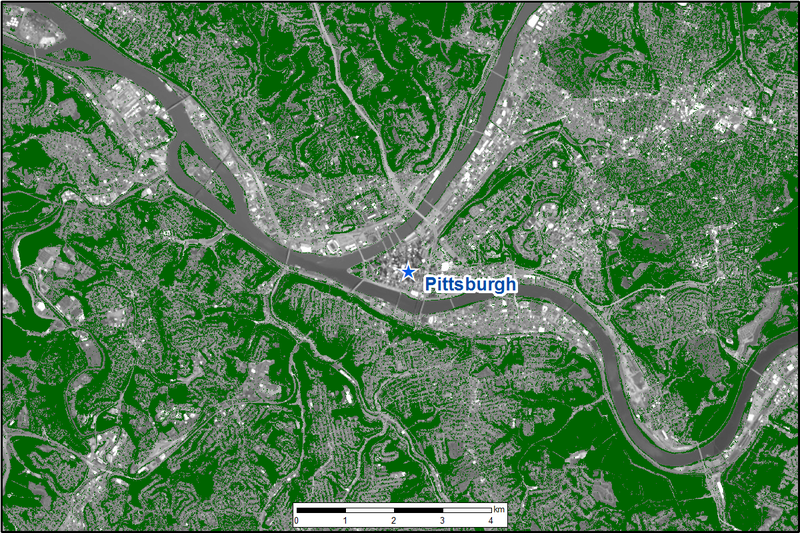 Estimated tree canopy cover (in green) near Pittsburgh, Pennsylvania, for the year 2008. This data set provides estimated high-resolution (1-m) tree canopy cover for the state of Pennsylvania, USA, in 2008. The data were derived from county-level Light Detection and Ranging (LiDAR), leaf-on agricultural imagery, and building polygon data. The LiDAR data consisted of point clouds in LAS format. The LAS point clouds included a classification that identified ground points, information on the number of returns for each point, and intensity values, among others. The imagery consisted of 4-band (blue, green, red, near-infrared) data acquired during leaf-on conditions in the summer of 2010 through the NAIP at a resolution of 1 m. Building polygon data were available for 12 of the sixty-seven counties in the state. The data were processed with a rules-based expert system which facilitated integration of imagery and LiDAR into a single classification workflow, exploiting the spectral, height, and spatial information contained in the data sets. There is one file in GeoTIFF (.tif) format with this data set which provides the estimated tree canopy coverage for the state of Pennsylvania for the year 2008. The approach used to generate this data set could be used to provide estimates at fine spatial resolution in other areas with LiDAR data coverage. High-resolution maps provide a valuable reference to improve the analysis and interpretation of large-scale maps produced through NASA's CMS project. The output vector tiles from the automated system were subjected to manual edits by a team of trained image analysts operating at a scale of 1:10,000. The focus of the manual editing process was to address issues that could not effectively be automated. Pennsylvania tree canopy cover estimates were derived from county-level 2006-2008 LiDAR point cloud data, building polygon data obtained from certain counties, and 2010 leaf-on imagery from the NAIP. A 1 x 1-m pixel was identified as having tree canopy present (value=1) when it (1) contained an object 2-m or higher, (2) was not a known building and/or (3) had a complex LiDAR return structure (typically trees) as compared to those with a simple return structure (typically buildings). The system for extracting tree canopy had to meet several criteria: 1) flexibility to account for differences in the source data, 2) yield a product with a 95% or better user’s accuracy, 3) integrate raster and vector data into a single processing environment, and 4) efficiently process large amounts of data. Based on these criteria a system was developed that centered on the eCognition software platform (Trimble, Sunnyvale, CA). eCognition’s object-based technology which enabled raster and vector data sets to be combined in a single operating environment in which rule-based expert systems could be employed to classify features based on their spectral, height, and spatial properties (O'Neil-Dunne et al., 2014). Data were processed on a county-by-county basis. For each county the raster data sets (LiDAR and imagery) and vector data sets were loaded into an eCognition project. Building on systems developed for prior tree canopy mapping projects (MacFaden et al., 2012; O’Neil-Dunne et al., 2012), two rule-based expert systems were designed to handle each of the two data scenarios. Each rule set contained a series of tiling, segmentation, classification, and morphology algorithms designed to extract tree canopy. The purpose of the tiling operations was to break the data into smaller chunks to distribute the processing load (O'Neil-Dunne et al., 2014). The LiDAR data included a classification that identified ground points, information on the number of returns for each point, and intensity values, among others. For all LiDAR data the point density ranged from 0.6 to 3.3 points per square meter, depending on the county and collection parameters. The NAIP imagery consisted of 4-band (blue, green, red, near-infrared) data acquired during leaf-on conditions in the summer of 2010 at a resolution of 1 m. Building polygon data were available for 12 of the sixty-seven counties in the state. Each county LiDAR collection was processed to create various raster surface models. The raster cell size was set based on the average point spacing. The LiDAR data were processed to yield a raster Digital Surface Model (DSM), and a raster Digital Elevation Model (DEM) from the return and classification information contained in the LAS attributes. The DEM was then subtracted from the DSM to create a Normalized Digital Surface Model (nDSM), in which each pixel represented the height above ground. In addition to the nDSM the LiDAR data were processed to yield a Digital Terrain Model (DTM) from the last returns. A Normalized Digital Terrain Model (nDTM) was then created by subtracting the DEM from the DTM. The NAIP imagery was simply assembled into county mosaics. Building polygons were retained in their original vector format (Shapefile). 1) A single height threshold was used to separate out tall features, defined as those objects 2-m or higher, the minimum height definition for tree canopy for this project. Included in this step was a gap filling routine designed to ameliorate the gaps in deciduous canopy stemming from the leaf-off nature of the LiDAR. 2) Tree canopy was differentiated from buildings based on a combination the imagery, LiDAR, and, if present, building polygons. This step is where the main differences in the two rule sets arose. The difference between the nDSM and nDTEM layers emphasized tall features with a complex return structure (typically trees) from those without (typically buildings). For counties that had building polygons, additional rules were incorporated to account for the fact that tall features within building polygons were most likely buildings, with the exception of the overhanging tree canopy. The rules in the second step consisted of simple thresholds that could be modified to account for the unique characteristics of the data sets in each county. 3) Tree canopy features were exported to a vector data set. Context-based rules were used to refine the tree and building classes based on spatial relationships. The context-based rules served to address issues of class confusion, primarily along tree/building borders. However, the rules also addressed other issues such as objects in the middle of a forest, that while sharing all the properties in the imagery and LiDAR of buildings, were unlikely to be so due to the absence of other buildings in the vicinity. Once this iterative process was completed morphology routines were employed to restructure the canopy, removing slivers and spurious objects. The appropriate rule-based expert system was applied to the county based on the two data scenarios. As the data in each county proved to be unique, the rule-based expert system was tested, and modified accordingly on subsets of the data prior to execution. The output vector tiles were then subjected to manual edits by a team of trained image analysts operating at a scale of 1:10,000. The focus of the manual editing process was to address issues that could not effectively be automated. Following the completion of the manual edits the data were compiled into a statewide tree canopy mosaic (O'Neil-Dunne et al., 2014). MacFaden, S. W., J. P. M. O’Neil-Dunne, A. R. Royar, J. W. T. Lu, and A. G. Rundle. 2012. High-resolution Tree Canopy Mapping for New York City Using LIDAR and Object-based Image Analysis. Journal of Applied Remote Sensing 6 (1): 063567-1-063567-23. O’Neil-Dunne, J.P.M., S.W. MacFaden, A.R. Royar, and M.Reis. 2014. An Object-Based Approach To Statewide Land Cover Mapping. Presented at the ASPRS 2014 Annual Conference Louisville, Kentucky, March 23-28. O’Neil-Dunne, Jarlath P.M., Sean W. MacFaden, Anna R. Royar, and Keith C. Pelletier. 2012. An Object-based System for LiDAR Data Fusion and Feature Extraction. Geocarto International (May 29): 1-16. doi:10.1080/10106049.2012.689015.